IT Pro's Hiring Kit - Includes latest IT Salary Data, Interview and Hiring Guide, and 300 Job Descriptions - In today's economy, nearly every organization faces pressure to have the right talent in place, run at peak efficiency and "do more with less". With the economy improvement and lowest unemployment numbers in several years, HR departments are pressured to get qualified professionals on board now. In today's employment market, it is critical to make every hire count. There is little room for error. It is crucial for senior-level leadership, human resources and hiring managers to all be on the same page and do the right things. In addition, it's a good time for CIO and IT managers to direct HR to keep the hiring pipeline flowing. To that end, Janco has created an IT Hiring Tool Kit aimed at getting that process flowing. With it in place, HR and IT teams can work together to get results. Building an excellent IT staff your company requires offering the right jobs at the right salary levels. Only the IT Hiring Resource Kit provides the industry-standard job descriptions and up-to-date salary data you need to recruit top talent as effectively and efficiently as possible. The salary survey includes a list of the benefits provided by enterprises of all size. Is your company providing the right benefits. This indispensable resource provides up-to-date salary data gathered through an extensive survey of businesses throughout the United States and Canada, plus polished job descriptions for the 73 IT positions surveyed. This proprietary information reduces the time it takes to recruit top talent and ensure that you get the right person for each job. 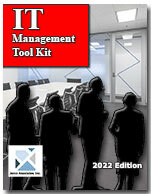 The IT Hiring Kit comes in four (4) versions and each is available with an update service. For best practices, we suggest the Platinum Edition, as it has everything that is needed to meet all mandated job description requirements. Latest IT Salary Survey - The salary survey draws on data collected throughout the year via extensive Internet-based survey instruments and completed survey forms from businesses throughout the United States and Canada. The survey data reflects IT salaries in 78 major cities in the United States as well as 23 cities in Canada. Summary data is provided in both the PDF document and a separate Excel Spreadsheet. Salary Survey Job Descriptions (PDF) The job descriptions are provided as a 206 page indexed PDF document for all of the positions surveyed. The PDF file can be viewed and printed. Interview and Hiring Guide (WORD and PDF) Includes two electronic forms (Background Check Authorization and Interview Questionnaire) and two full job descriptions (Manager Human Resources and Human Resources Specialist). 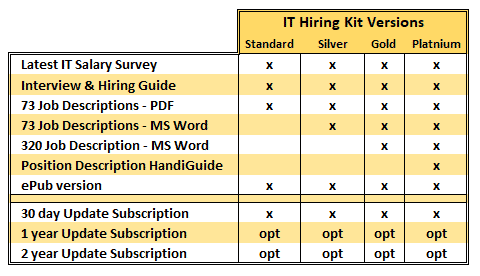 Salary Survey Job Descriptions (Word) The IT job descriptions are provided as 73 individual word files using long file names. Internet and IT Job Descriptions (Word and eReader) The 300 Job Descriptions have been extracted from Janco's Internet IT and Position Descriptions HandiGuide™. Each job description has a copyright date of . - Includes all of the positions in the IT Salary Survey.